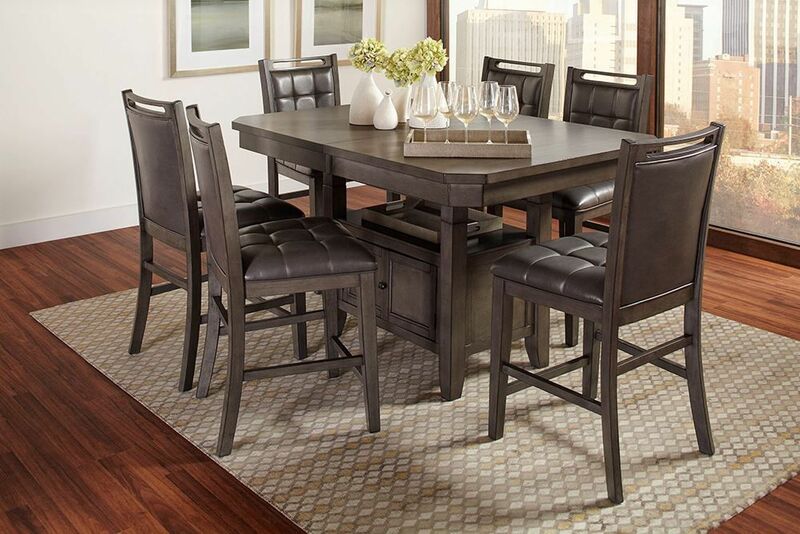 Upgrade your dining space with the Manchester Convertible Extension Table with Six Stools! This multi-functional, super stylish dining set is just what your room has been lacking, featuring an easy access storage base, a butterfly extension leaf, smooth grey finish, contoured corners, faux leather, and tufted upholstery. Plenty of room for seating and plenty of room for storage as well, this set is the perfect fit for you. Discover all the wonderful possibilities of the Manchester Convertible Extension Table with Six Stools today! Upgrade your dining space with the Manchester Convertible Extension Table with Six Stools! Table extends in width from 60" to 73"
Set includes table and six stools.